Posted on January 26, 2011	by Megan L.
Archeology and dating go hand-in-hand. Dates allow archeologists to connect a site/deposit to a specific time period, allowing us a better understanding of the past. Historical archeologists have an advantage when it comes to dating because of the written historical record. When we study a site, we also study the documents associated with the site. For Historical archeologists, ceramics are a diagnostic tool for dating because many English ceramic types can be dated to within 5 or so years of their manufacture. Access to this knowledge led to something called the Mean Ceramic Date. The Mean Ceramic Date, developed by Stanley South, is a system that uses statistics, known dates of manufacture, and ceramic sherds to date a site. Although an object may have a known manufacturing date, this does not mean that the object was used when it was made. A known manufacturing date tells us that the site cannot be older than the object, but that doesn’t mean that the site is not a lot younger. Think about the things you own. Do you have antiques? A hand-me-down set of dishes you inherited when you went to college? The presence of these things can throw off the mean ceramic date. So archeologists need other ways to date. In an ideal world, every deposit would contain a dated penny. Sadly, the majority of artifacts are not stamped with their date of manufacture. Instead, archeologists have to be a bit more creative. How do pipe stems fit in? 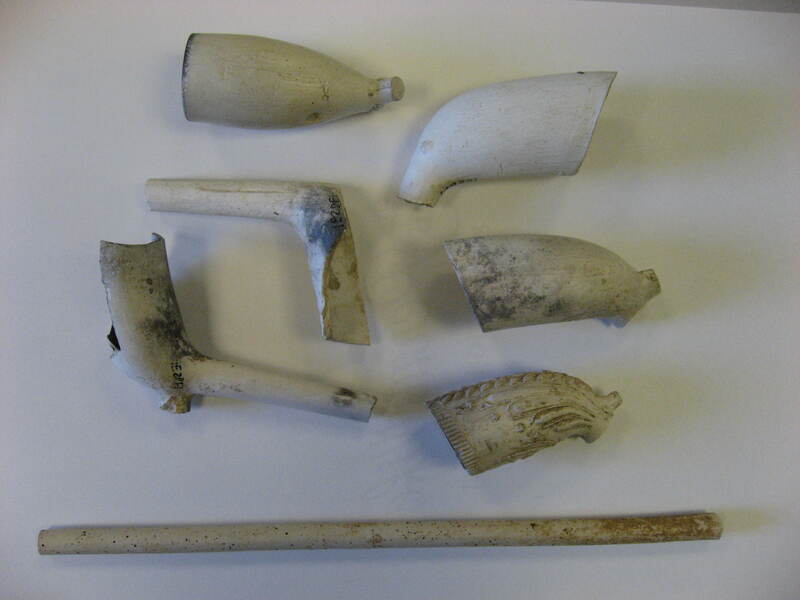 Pipes were very common in colonial times following the introduction of tobacco to England in the late 16th century. When archeologists first started using pipe fragments to date sites, they relied on the bowl of the pipe (where the tobacco goes). The size and shape of the bowl changed over time, making it a useful tool for dating. 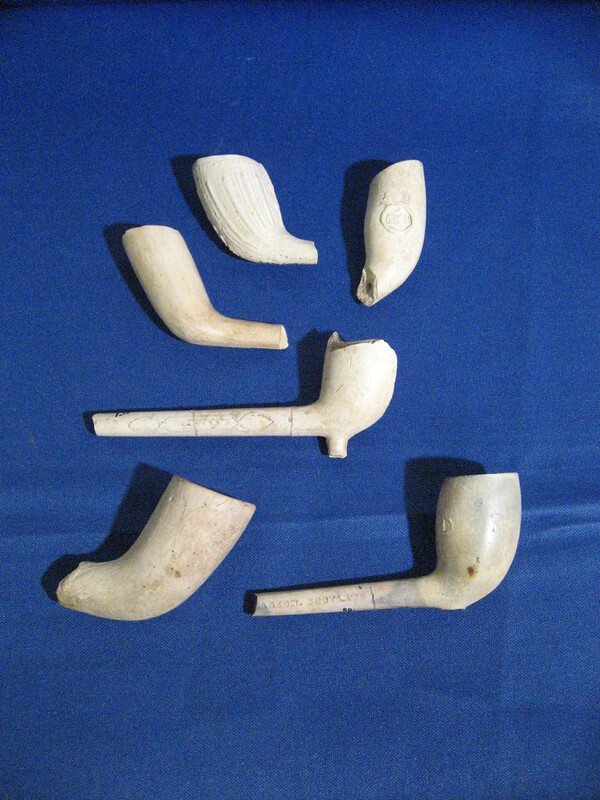 Except bowls are not found as often as pipe stems, which occur in abundance on sites. To counter this problem, archeologist J.C. Harrington, who worked at Jamestown, looked at bowls that still had part or all of the pipe stem attached. By analyzing the data, Harrington determined that the diameter of the pipe stem became smaller over time, unlocking a great tool for dating. To make use of the above chart, you first have to identify the diameter of the pipe stem in question. 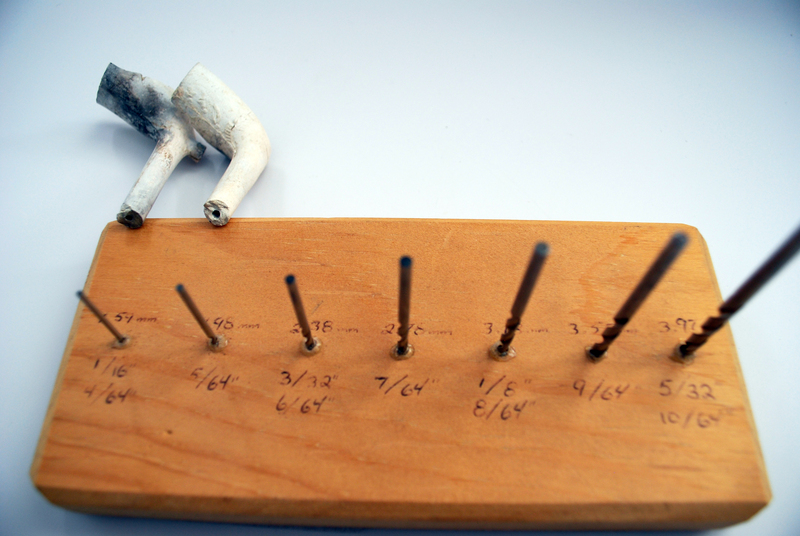 One of the easiest ways to determine the diameter of a pipe stem is to use drill bits. By seeing which drill bit the pipe stems fits on top of, you can determine the diameter of the pipe stem. 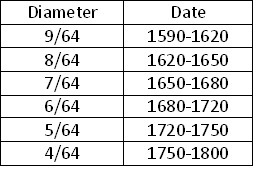 Why did the diameter of pipe stems decrease over time? The main theory provided by James Deetz in his book, In Small Things Forgotten, is that bore diameters decreased to compensate for an increase in the length of the stems. But why did the stems increase in length? Tobacco was becoming more readily available. Better access to tobacco meant a person could smoke more tobacco, meaning bigger bowls to hold the extra tobacco. But bigger bowls burn longer and hotter. A longer stem would have kept the bowl (and heat) further from the mouth. Another theory among archeologists for the decrease in bore diameters is that tobacco became more refined, meaning the pieces of tobacco were smaller. Smaller particles would require a smaller hole to keep the debris out of one’s mouth. What do you think about these theories? Do they sound plausible? Or are there other reasons that could account for the decrease in bore diameter? And why do you think we find so many pipe stems? Is it because people break them off because the stem gets dirty? Or do you think it’s just because the pipe stems were fragile and easily shattered into many pieces? This entry was posted in Spotlight On... and tagged bore diameter, dating, dating archeological remains, mean ceramic date, pipe stems, Pipes. Bookmark the permalink.